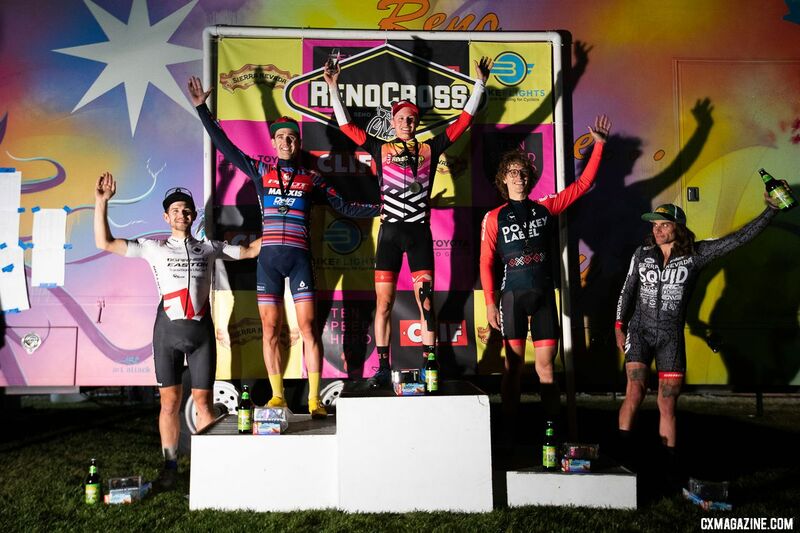 Cyclocross fans who headed to Rancho San Rafael Park for the first-ever RenoCross got to watch two totally different kinds of races. 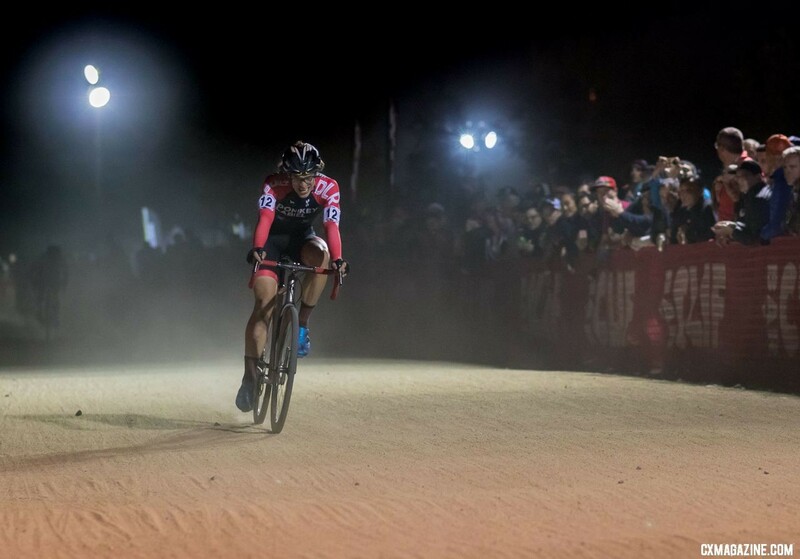 In the Women’s race, Maghalie Rochette dominated and went wire-to-wire to win. The Men’s race, however, featured an endless stream of lead changes, and when riders heard the bell, seven of them still had a chance at winning the race. Stephan Davoust (Giant Bicycles), Lance Haidet (Donnelly), Michael van den Ham (Garneau-Easton p/b Transitions LifeCare), Tobin Ortenblad (Santa Cruz / Donkey Label Racing), Anthony Clark (Squid Squad) and Bjorn Selander (Donkey Label / Bingham Built) were all hoping to find the one extra gear or right move to take home the win. After a relatively quiet weekend in Rochester, Driscoll came alive in the last lap. His effort drew out Haidet and forced Selander and the others to desperately chase as the meters of course left ticked down. Haidet took the lead in the backstretch of the course and held it to pop out onto the finish stretch first. 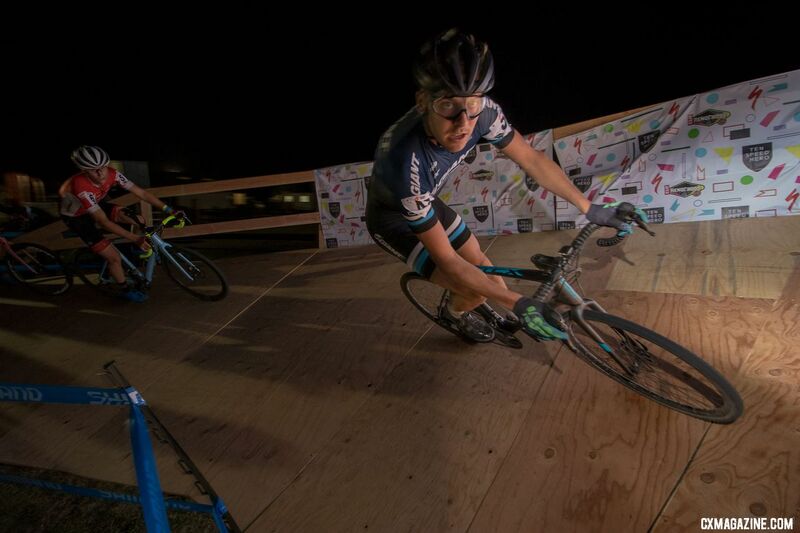 He held off Driscoll in the drag race to the finish to take home the win after a bunched-up 60 minutes of racing. 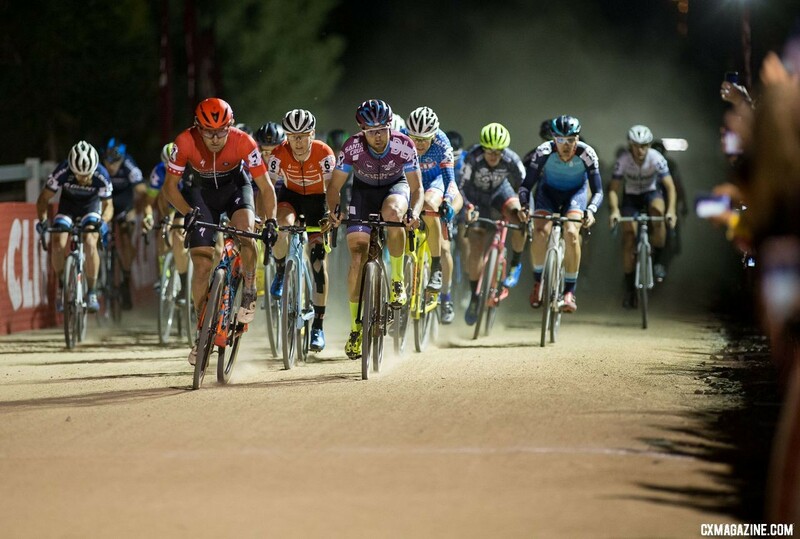 When folks first looked at the course for the 2018 Reno Nationals, there was a lot of talk about group racing and grass crits. However, with the long uphill stretch at the start of the lap and the technical climb and descent, most of the races over the Nationals weekend (save the Elite Men’s, most notably) were broken apart pretty quickly. 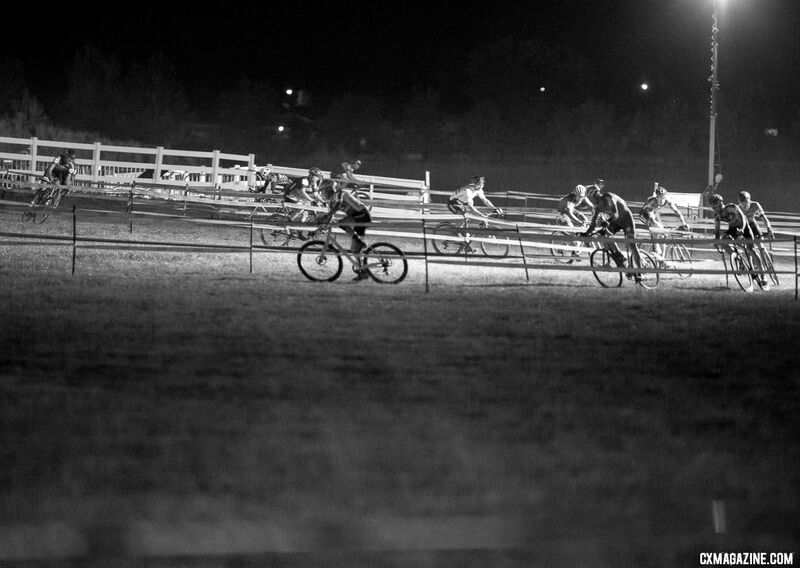 The course for RenoCross did not include big hill and the long uphill slog, and the men responded by forming a giant pack of riders at the front of the race. Cody Kaiser (LangeTwins / Specialized) took the holeshot and then nearly the entire field lined up behind him as the train navigated the grassy course. Haidet led at the midway point of the first lap, and then Troy Wells (Clif Bar) pulled through on the start/finish stretch. With one lap in the books, a full 15 riders were within 10 seconds of the leader. At the end of the second lap, Haidet led a group of 12. By the end of the race, no less than eight of them would hold the lead at one point in the race. One area of the course where riders seemed to be able to gain a bike length or two was the sand pit. Haidet, who had a strong weekend in Rochester, was not afraid to assert himself early on, and in the third of nine laps, he got a bit of a gap by hitting the sand pit first. As you may have guessed, however, the lead was short-lived. Davoust stepped up to take his turn at the front. During the next three laps, Van den Ham, Clark, Allen Krughoff (Chocolove Specialized) and Driscoll all took turns on the front. The lead group was still 11 after Geoff Kabush (Yeti Maxxis Shimano) reattached to join the party. Inside three to go, the lead group finally got a shakeup thanks to a crash. A tangle between Selander and Krughoff turned into a spill in a corner, and left Clark and Krughoff picking themselves up and and holding up the riders behind them. The leaders were now Davoust, Haidet, Van den Ham, Selander and Driscoll as Ortenblad and the others desperately chased behind them. 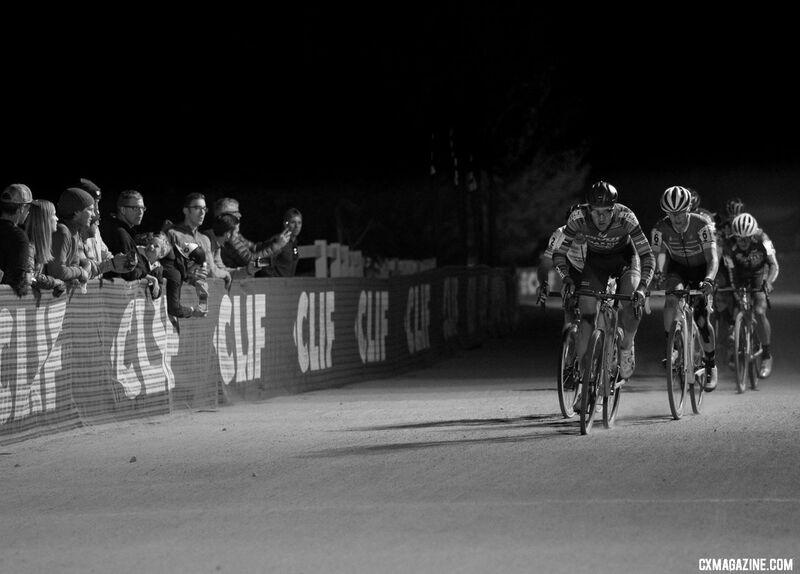 Over the next lap, the group of six stayed static until Clark powered back to rejoin the leaders. At the bell, seven riders had a chance to win the race—or potentially fall out of the top 10. 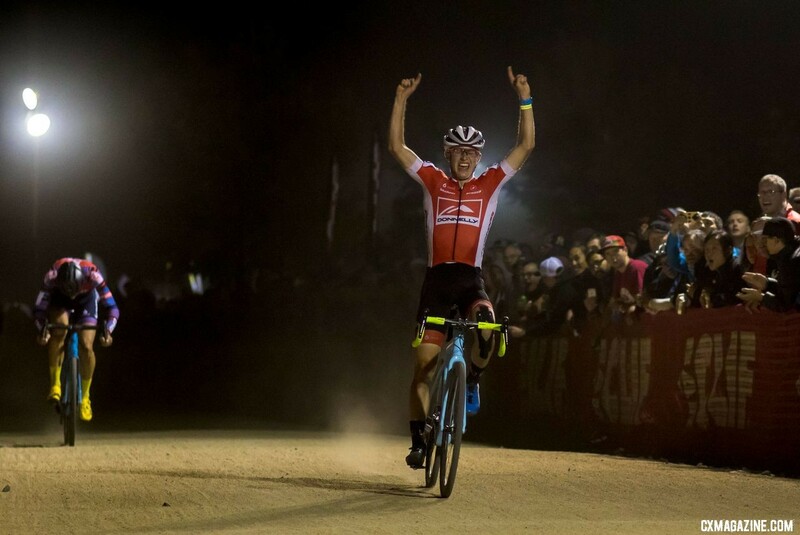 Driscoll is known in U.S. ’cross for his diesel engine, and in the bell lap Wednesday night he put it to work. Driscoll put in a big effort early in the lap to put pressure on the other six riders. His power drew Haidet out, while Selander did his best to keep pace as the first chaser. The other four scrambled to survive. Driscoll and Haidet hit the sandpit flying and carried a small three or four-second gap through the feature. Over the next few hundred meters, Selander almost made contact but found himself dangling perilously close to the two leaders as the trio passed pit two. The last stretch of the course was a maze of grassy turns and power straights. With Driscoll all-in, Haidet found an extra gear to pull past his former Donnelly teammate and take the lead heading toward the finishing straight. Haidet made the right-hand turn on the finishing stretch first and unleashed a sprint that probably felt like one of the longest of his career with Driscoll close behind. Photos, notes and results are below. Zachary Schuster, Andrew Yee and Peloton Sports contributed to this report. 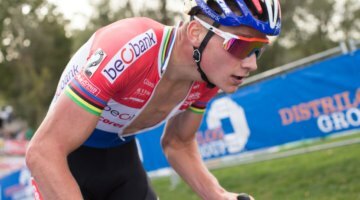 Jeremy Powers did not race due to an illness. On Instagram, he announced he will also be missing this weekend’s races in Waterloo. Lance Haidet rode a Donnelly C//C cyclocross bike with Ultegra Di2 and TRP Spyre disc brakes, even though the team is sponsored by FSA and will ride the new WE wireless electronic drivetrain. He said he hopes to have both bikes set up with the FSA drivetrain by Jingle Cross. He rode LAS tubulars at 24.5 psi front and 25.5 psi rear. Should the tire be renamed to RNO? Fourth place Michael van den Ham came into the race nursing a cold, and working the floor. The Canadian champ is working for a wheel company and spent much of Tuesday and Wednesday on his feet helping his employer. What are these tubeless maxxis tires Driscoll rode?